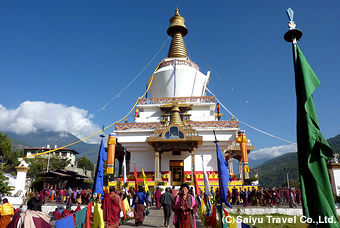 Tour Paro and Thimphu in 4 days. 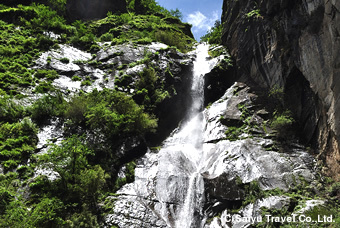 Visit a sacred place of Tibetan Buddhism, the Taktshang Gompa. 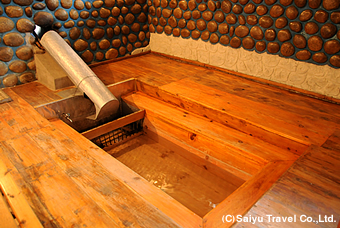 Enjoy the experiences of wearing the ethnic costume and taking a bath of Dhotso. 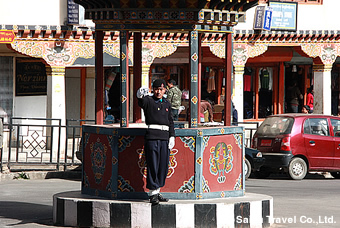 After arrival in Paro, meet a guide at the airport and stroll the town of Paro. Then, go to the capital city Thimphu. 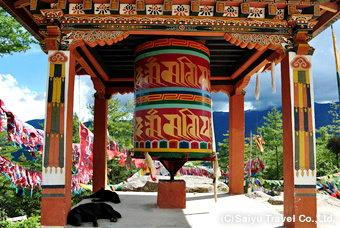 In the morning, tour the Dochula Pass in the suburbs in Thimphu . On the way, view the exterior of the oldest palace (castle-monastery) Simtokha Dzong from far away. For dinner, savor the Bhutan cuisine. In the morning, head to Paro. View the Drukgyel Dzong was built for commemorating the victory of Bhutan over Tibetan Army. 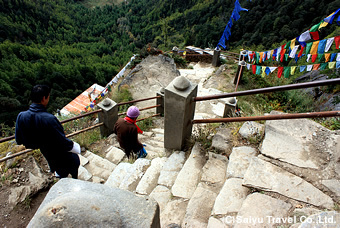 Then, climb up to the Taktshang Gompa is a sacred place in the Tibetan Buddhism World (a round trip 5-6 hours). 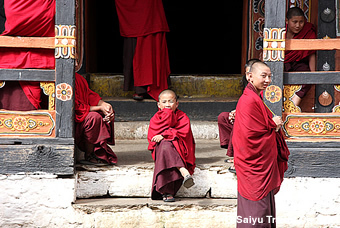 And tour the oldest temple in Bhutan, Kyichu　Lhakhang, visit a private house, etc. At night, enjoy wearing the Bhutan traditional costume and taking a stone bath of Dhotso. In the morning, a guide will see you off at the airport. ※The entrance of Bhutan, Paro airport is located in the valley. Therefore, the planes are often affected by weather conditions which cause the departure and arrival of planes delay. Also, the place where go through and the time of arrival and departure are suddenly changed. ※Because of local situations such as events and ceremonies are conducted, Dzong and monasteries cannot be entered. In such case, please understand beforehand, view their exterior only. ※In Bhutan, smoking in the public place is prohibited. Also, to bring cigarettes and tobaccos in the country is required to declare and imposed 200% tax, but in your room at the hotel, you can smoke. The air fares are not included in the price on the list below. If you want to buy the air tickets, we could introduce you the best rates on the day. 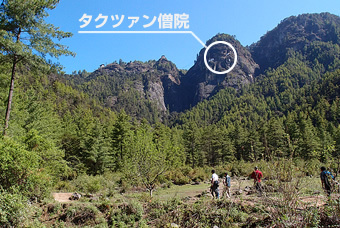 ※In Bhutan, the hotel charges are changed by a month to visit. In case you consecutively travel in two months, the price is different from the above-mentioned, please enquire us. ※The above mentioned prices would be added up the service taxes 4.35% of India’s Government Tax. ※The hotels in Bhutan provide good services, however, the country is located in the mountain and the infrastructure is insufficiently constructed, so sometimes the supply of power and water does not function. ※In case all rooms are booked when you reserve, we would introduce you the same class hotels. ※If you want to stay at an accommodation other than the mentioned in above, or if you want to stay in a specific hotel or a private house, please contact us for consulting. 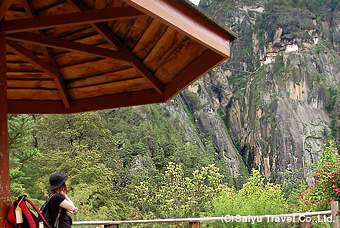 This is a private tour a guide accompany you with a private car in Bhutan! The private car is used for you exclusively. You can enjoy the tour feeling easy and comfortable. Sri Lanka where the bright Buddhism culture flourished since the ancient time. Visit 3 World Heritage sites which the kings of Sinhala Dynasty established. Go around Paro and Thimphu in 3 days. 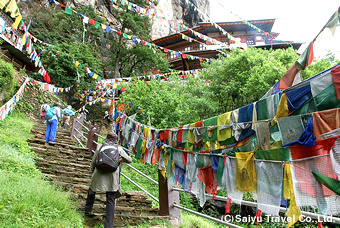 Visit a sacred place the Taktshang Gompa is well-known in the Tibetan Buddhism world. At the east side of Himalayas, the small Kingdome of Bhutan exists. This country has the atmosphere differs from those in India, Nepal and Tibet, and gives the calm and relaxing time. This tour includes the plans to experience the traditional culture in Bhutan such as wearing the traditional costume, taking a heated-stone bath Dhotso, etc. We have arranged the tour in Bhutan for 40 years. Please let us handle Bhutan tour and related. 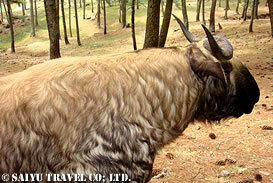 Saiyu group launched the group tour to Bhutan in 1975 at first in Japan. Since then, it has been providing the committed tour plans in Bhutan. Of course we could handle to extend your stay at each location and to arrange the itinerary. 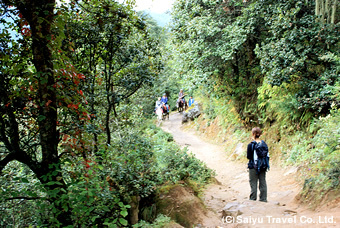 In addition to the mentioned plans, it is possible to provide various plans; to stay-in private house to experience the traditional way of life, to stay in the first class luxury resort hotels the foreign capitalized hotel companies have launched year by year, to view festivals, to tour the historical sites in the central Bhutan, to visit Merak and Sakten in the east of Bhutan where a tourist is allowed to enter in from 2010, to tour the adjacent countries in Asia, etc. Please consult us for any travel arrangements, such as single person tour, group tour, training tour, photo shooting tour, etc. We utilize our know-how of specialists on travelling and support you with our best! Flag signaling at the crossroads in Thimphu . “Tak” = tiger and ”tshang” = nest. 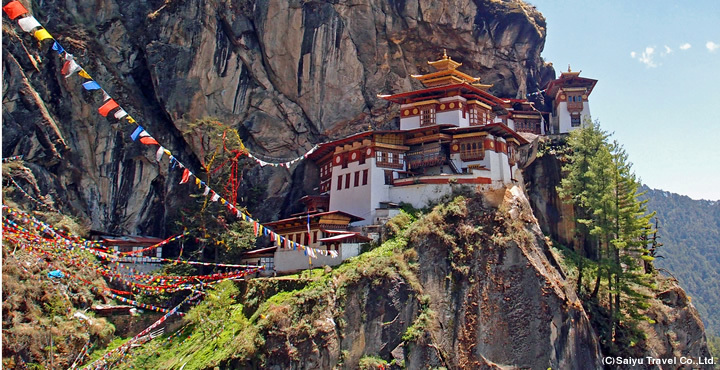 The name of this monastery is “tiger nest”. The place is the sacred one has a legend that Guru Rinpoche (Padmasambhava) who introduced Buddhism to Bhutan was transformed the figure in the one of 8 forms anger and came in riding on tiger. The monastery was built on the precipice as if it is glued and the dignified appearance made a viewer feel overwhelmed. The way to the monastery takes about 2 hour and half on one way walking slowly and having a break. 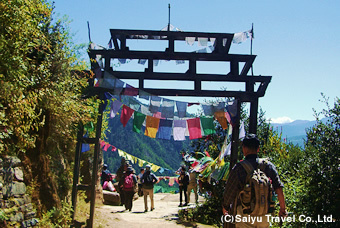 After viewing the monastery for 30 minutes, the way to return is 5 – 6 hour hiking. 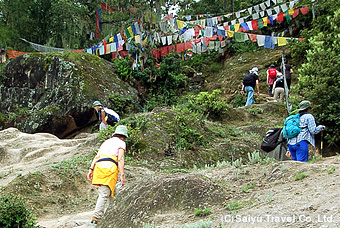 On the way back meet the people in Bhutan who head to the sacred place and greet may have the time to feel the people in Bhutan are strong religious minded. Start hiking listening to the sounds of stream. The way to the first observatory is relatively mild ascent takes about 1 hour. It is possible to go there riding on a horse, but who are not accustomed with riding a horse is better to climb on foot. At the starting point, go on the flat road at first. Gradually the way becomes ascent and there are 99 hairpin turns. A large Mani wheel appears, the first observatory is just ahead. In the first observatory, there is a cafeteria. After having a rest here, climb up the ascent slope for about 40minutes to aim at the second observatory. The ground on slope is red soil continues to the entrance of forest. After rain, the surface of slope is slippery, so be careful while walking on your foot. Going through the forest, the slope gradually becomes mild and the gate of second observatory appears. Passing the gate, the Taktshang Gompa is in front of you. The second observatory is the suitable spot for photo shooting. After shooting photos for a while, go forward. Go down to the bottom of waterfall on a steep staircase. Cross a bridge having the cool spray from waterfall, climb up the mountain path through trees, and a view opens. Climb up the last staircase to lead to the monastery. ※You can view the ※monastery from the first observatory and the second observatory. On your choice and request, we could go back to the starting point from each observatory.